Back in October Jimmy's agent contacted us to say that, in appreciation of the approaching 10th anniversary of the website, we were invited to a sneak preview of Parents of the Band before its TV release. Having had a chat with the man himself and then watching the show at a private screening just for us, Jimmy took us out to dinner in the West End. Even insisted on paying our cab fare back to the station. Obviously disappointed that Jimmy was not involved in the 2008 Sunday For Sammy show. We don't know why and wouldn't like to speculate. It was touch and go as to whether I (Alan) would make it myself as I have been on crutches for 2 bloody months after dislocating my knee while on holiday in December. The show was excellent nevertheless and it was a great idea to have additional Auf Pet members (Tim Spall and Christopher Fairbanks) involved in place of Jimmy. Also nice to meet Claire (who we know only from correspondence through the website) and her friends in person for a beer after the show. Result! When we got back to the hotel we walked right by chance into the middle of the after show party! Pretty much the entire cast was there and Sharon got a kiss from Tim Healey and chatted to Billy Mitchell while I drank a few beers. I have been working on the new look site for what seems like forever - didn't realise how big the damn thing had grown over the past 8 years! There are still a few pages missing and a few tweaks to make but we hope our readers will appreciate the fresher, more consistent style. The web page code (HTML) is much tidier and concise, although you won't notice the difference, and the menu anchored in the top left of each page is something of a departure. Please let us know if you have any difficulty using the new site (it has only been tested in the main browsers). Blimey, is it really that long since we wrote anything? I finally paid out some hard cash to ditch the pop-ups and advertising on the guestbook. Let us know if you have any problems. Hope to see some of you at the Sage on 26 Feb 2006 for the next SFS show. The debate rages on the Guestbook.....is Jimmy a nice guy or the Prince of Darkness......does it matter or not? Sharon and I started the site over 3 years ago and have never treated it as way to become "best mates" with Jimmy. We always suspected that to meet him might spoil the magic. He wrote to us once to correct an error we had printed but at the same time he graciously complimented the site. It's clear that he wants no direct involvement which is reasonable since he didn't ask us to do this in the first place. The idea of the site has always been to celebrate the multi-talents of Jimmy and to provide a much needed forum for other fans to find out stuff and swap ideas. Initially it was just an excuse to see if we could build a website and we got carried away. We love his music, his films and his TV appearances. If he was a top bloke as well that would be a bonus....but it's not essential; we know that Jimmy is a very private man and we respect that. As for the argument of what an artiste "owes" his fans, we think the answer is "nothing". You pay £15, you get a CD, Jimmy pays his mortgage, you have a CD to listen to - everyone's happy. We know that it doesn't cost anything to be nice to people but at the same time a CD isn't a voucher to intrude into someone's private life. One day last summer we were sitting outside the Cliffs Pavillion and as I raised my beer glass I spotted Jimmy getting out of a 4-wheel drive 100 yards away. I wondered whether I should keep quiet or tell Sharon and Lorri (and risk a potentially unpleasant confrontation)........ Sharon and Lorri shot off like whippets and I had a job to catch up. Much to my relief, Jimmy was fine about the 4 of us descending on him. I suspect he had heard something about the crazy Canadian (Lorri) who had been stalking Geoff Dugmore and other band members outside the venues, and was curious. He asked about the website, again complimented us on it, and let us take a couple of photos which he gave us permission to publish. Then off he went for his dinner. I don't suppose we'll have any further contact with the man, (although Sharon's still convinced that we will) but we have good memories of our brief encounter. In the meantime we take great pleasure in the CDs, the videos and Auf Pet on Sunday nights. Thanks Jimmy. Blimey. It's all go at the moment. Loads of new stuff to go on the site - pictures of the gigs at Ipswich and Southend, not to mention some amazing shots of Sharon, Jimmy and members of the band outside Cliffs Pavillion before the Southend show! We just got back from a holiday in Canada. "So what?" I hear you ask. Actually, this is very relevant to the whole JN.net project. 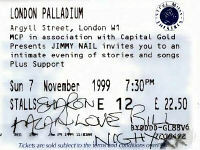 I first started "Sharon's Jimmy Nail fan page" about 18 months ago, by scanning in a few CDs and pictures. I didn't think it would amount to much and had much bigger plans for all my other web projects. Much to my surprise I started to received feedback very quickly, mostly from a Canadian called Lorri who had recently discovered Jimmy Nail and was into his music in a big way. Lorri has been our biggest supporter and is really the reason why the site has grown into such proportions (and to blame for me losing a million hours of my free time). Just like those crazy people you read about, our "internet friends" Lorri and Tim came to stay with us last year and we all went to see Jimmy Nail at the London Palladium (it was Lorri's question "When are you coming to Canada?" that Jimmy read out). Lorri and Tim returned the favour and we had an incredible time together travelling around Ontario. I will never forget hurtling across New York State in an air-conditioned van with the entire Jimmy Nail CD collection blasting out of the speakers. Ok, absolutely no feedback whatsoever on the new site, so I take that you are happy for me to proceed. I will redirect jimmynail.net to the new address. In the meantime I will leave the old site as it is, but will not update it further. Please let us know if you have any problems with the new site. Blimey, that didn't take as long as I thought. The idea was to cut down on navigation buttons, frames and stuff that slows things down for visitors, while keeping the site easy to use. The buttons have been replaced with a few key links to everything else, with just a couple of the most regularly visited items directly advertised on the home page. Sitting indoors on a bright sunny morning. What a sad man. Planning a major re-vamp of the site. This is going to take ages, but it's looking good so far. We just got back from Newcastle - what a cool place! Finally got to stand and look up at the Tyne Bridge. We went to our second gig of the new tour on Monday 6 December, at the Cliffs Pavillion, Southend. We didn't look forward to it as much as on previous occasions - the new format is very different from other tours and the London Palladium evening took us somewhat by surprise. Actually, we didn't like it. Anyway, having to get home from work from London, we turn up a bit late at Southend. Once again we give Celtus a miss. I don't like Irish music so this is no loss. Before the main event Sharon had a chat to some of the people flogging the T-shirts. They told her they had heard that Jimmy was thinking of doing some sort of "internet fan-club." Anyone know anything? The Southend Pavillion is a pokey little venue with wonky seats. We hope that no one (there are four of us) needs to go for a pee during the set because the long rows of seats have no breaks in the middle. It is also about 90 degrees, air-conditioning being unheard of in South Essex. The lights dim, and any reservations are forgotten as the big guy strolls out and launches into Tadpoles in a Jar. The sound and the lighting are fantastic. The whole vibe is so much better than the London gig. I don't know if it because Jimmy is more comfortable now, having done loads of shows in the "new format" or because we now know what to expect - or a bit of both. Either way, Jimmy is on top form. The between-songs banter is funny, different from the other show (which can't be easy). He tells us about the time Paul Gascoigne (Gazza) spotted him at an airport and proceeds to embarass him by shouting "Jimmyyyy!! Jimmy Naiiill!! Actor stroke singer!" Actually, that is a fantastic idea for a JN web-site name. "actorstrokesinger.net" would be my choice if I was starting over. Gazza then shows off his "800 poond" Versace watch - he can't tell the time as it has such an abstract design, but it is a "canny watch, like" nonetheless. Jimmy tells us about his "bed scene" with Madonna in Evita . He suspected she might try something and so he has the wardrobe department sew up the fly on his boxer-shorts. She is way ahead of him and makes a grab up the leg of his shorts! Spare my blushes. The book of questions from the audience has the usual stuff about Newcastle United. One asks "what is your favourite song that you have written?" He is quite clear about that - Big River. When he starts singing that it really is magical - we sit spellbound at the emotion and the feeling in that incredible song. Someone else asks "why do TV programmes about the North East always have the same 5 actors?" This not only gets a laugh but a round of applause as well. Jimmy makes a defensive comment about how few programmes are set in he North East. I thought he might mention Sammy Johnson (sadly missed) but that doesn't happen. The set list is much the same as the London gig (as listed below), but Jimmy doesn't do the Bob Dylan song as an encore (much to our relief). We wander out into the cold night air with contented smiles on our faces, our faith in the man completely restored. Sunday night at the London Palladium we decided to give the support band a miss (too "deedly-deedly" for our taste). This turned out to be a major stroke of luck as we bumped into Bill Nighy (of Still Crazy) in the bar and he autographed one of our tickets. What a nice chap. The main event came as something of a surprise - completely different from what we expected. There were only 3 people in Jimmy's backing band: James Hallawell (keyboards, which were too loud), Callum MacColl (guitars) and Geoff Dugmore (percussion - you may remember him from previous gigs). We enjoyed the show, but not as much as the previous "big production" affairs. If you go to any of the shows please let us know what you thought. If you get to meet Jimmy (as a couple of you lucky people have told us you have done) we will publish your experiences on a new page. The best thing for us was the brilliant time we had with our "internet friends" Lorri and Tim from Canada, who came to stay with us and to go to the show. We were chuffed when Jimmy read out one of Lorri's questions (when are you coming to Canada - answer: it's too bloody cold). I wanted to publish some of the photos from the tour brochure but Sharon informs me that if I must violate copywright I should at least wait until the end of the tour. Fair enough. The new domain should now be up and running, so if you key in http://www.jimmynail.net you should get through to the home page as before. Even if you key in the old, long-winded address, the display bar should read as the new name. Please do us a favour - let us know if you experience any problems or if you see any advertising banners anywhere. This should not happen as we do not believe in bombarding you good people with advertising. That is why we still pay for our ISP rather than using a free one, so surf in peace! I need to figure out how to use the counter and tracker now that we have frames. They are missing for now. Only a matter of days until the start of the tour! To get us in the mood we were lucky enough to catch Jimmy being interviewed by Jonathan Ross on the radio yesterday morning. The man sounded pretty relaxed and switched on - he will be in good form for the gigs. Someone told us a bit about "the day my sister-in-law was sent flying by Jimmy Nail" and there have been other such anecdotal treasures over the past few months. Our very own Sharon nearly had one just recently when she was almost convinced that she saw Jimmy at Liverpool Street station in London. She followed him for a while - ducking into shops and the like - until she decided that "Jimmy wouldn't wear a suit like that" and gave up in disappointment. I'm sure that some of you out there can do better than that. We would like to ask any of you good people with such stories to E-Mail us and we will publish them on a page in this site. Be as verbose or as concise as you like (it's your story), but be sure to say whether you want your name included in the published article.